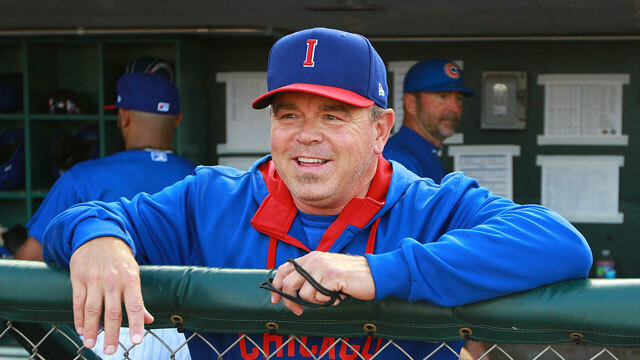 Marty Pevey has led the I-Cubs to 220 wins over the last three seasons. Des Moines, IA - Marty Pevey will return for his fourth season as the Iowa Cubs manager as the Chicago Cubs announced their 2016 minor league field staffs and coordinators today. Pevey matches Mike Quade's mark of managing four straight seasons with Iowa - most since the Iowa Cubs became Chicago's top affiliate in 1981. Hitting Coach Brian Harper, Assistant Hitting Coach Leo Perez, and Strength and Conditioning Coach Ryan Clausen also return with Pevey for the 2016 season. The Cubs welcome Rod Nichols as the team's new Pitching Coach and new Athletic Trainer Shane Nelson. Sean Folan also joins the staff as an assistant for both athletic training and strength and conditioning. Pevey led the Cubs to an 80-64 record last season, tied for third-best in the 16-team Pacific Coast League. The team finished tied with the Omaha Storm Chasers for second place in the American Northern Division, six games behind the Oklahoma City Dodgers, who led the league at 86-58. After three seasons, Pevey's record with the I-Cubs is 220-212 (.509), including back-to-back winning campaigns. He ranks fourth on Iowa's franchise list for career managerial wins behind Joe Sparks (355 from 1973-75, '77-79), Quade (283), and Jim Napier (224 from 1982-84). Sparks owns the overall franchise record for the most games as a manager. He led the Iowa Oaks as an affiliate of the Chicago White Sox and Houston Astros from 1973-75 and again from 1977-78. He also finished the 1979 season after Tony LaRussa was promoted to manage the White Sox and begin his Hall of Fame managerial career. The 2016 season will be Pevey's 33rd in professional baseball and his 14th as a minor league manager. His first assignment was with short-season Medicine Hat in the Toronto Blue Jays' organization in 1996. He is 864-829 (.510) as a minor league manager. He has won his leagueʼs Manager of the Year Award four times: 1998 with Hagerstown in the South Atlantic League, 2000 with Dunedin in the Florida State League, 2003 in the Eastern League with New Haven, and 2009 with Peoria in the Midwest League in his first season in the Cubs' organization. Pevey has also coached in the big leagues with Toronto as their bullpen coach in 1999, first base coach in 2006, and third base coach from 2007-08. He was the Cubs' roving catching instructor from 2010-12. As a player, Pevey was drafted by the Minnesota Twins in the 19th round of the 1982 draft out of Georgia Southern University. He played 13 seasons, including nine at triple-A. He made his major league debut with the Montreal Expos on May 16, 1989 and played 13 games in his only big league season. Harper also returns for his fourth season with Iowa and his sixth in the Cubs' organization. He managed at high-A Daytona in 2012 and double-A Tennessee in 2011. He has also represented the Cubs as the hitting coach with the Mesa Solar Sox in the Arizona Fall League in 2012-13. Prior to joining the Cubs, Harper managed in the Los Angeles Angels' system from 2001-07, including two years in the PCL at Salt Lake from 2006-07. From 2008-09, he was the San Francisco Giants' roving catching instructor and he managed their high-A team in San Jose in 2010. Harper played 16 big league seasons with the Angels (1979, '81), Pittsburgh Pirates ('82-84), St. Louis Cardinals ('85), Detroit Tigers ('86), Oakland A's (1987, '95), Minnesota Twins ('88-93), and Milwaukee Brewers ('94). He played in the World Series with the Cardinals in '85 and the Twins in '91. Nichols joins the Cubs organization after spending the last three seasons as the bullpen coach for the Philadelphia Phillies where he worked with Hall of Famer, and former Iowa manager, Ryne Sandberg. Nichols spent eight seasons as the Phillies' triple-A pitching coach with three different affiliates: Scranton/Wilkes-Barre (2005-06), Ottawa (2007), and Lehigh Valley (2008-12). He began his coaching career with the Phillies in 2000 and served as a pitching coach for class-A Piedmont (2000), class-A Lakewood (2001), and double-A Reading (2002-04). Nichols was born in Burlington, Iowa, but graduated high school in New Mexico in 1982 before going on to play baseball for three seasons at the University of New Mexico. He was drafted by the Cleveland Indians in the fifth round of the 1985 draft and pitched professionally for 13 seasons, including parts of seven years in the big leagues with Cleveland (1988-92), the Los Angeles Dodgers (1993), and the Atlanta Braves (1995). He pitched in the Pacific Coast League for Colorado Springs for a total of 42 games from 1988-90. Perez returns for his second season with Iowa and his eighth as a coach in the Cubs' organization. He played in the team's minor league system from 2003-08. He was a catcher in 2003-04 and 2008, reaching high-A his final season. He also pitched in rookie ball one season in 2006. Perez is a native of the Dominican Republic. Nelson will be in his sixth season as an Athletic Trainer in the Cubs' organization. He was born in Des Moines and now makes his home in Iowa City. He earned his degree in athletic training from Central College in Pella, Iowa and was an athletic training intern for the I-Cubs in 2010. He worked full-time at rookie-Mesa in 2011, single-A Peoria in 2012, single-A Kane County in 2013, and the last two seasons at double-A Tennessee. Folan begins his second season in the Cubs' organization. Last year, he served as the Minor League Rehab Athletic Trainer/Strength and Conditioning Coach based out of the Cubs' spring training complex in Mesa, Arizona. In that role, he worked with players on the disabled list from all levels of the organization. Folan is a Chicago native and graduated from Concordia University of Chicago in 2012 with a degree in exercise science. He went on to earn a Master's in Athletic Training from Florida International University in Miami in 2014. He is a certified strength and conditioning coach through the National Strength and Conditioning Association. Clausen returns for his third season with the I-Cubs. The Clinton, Iowa native is in his seventh season as a strength and conditioning coach in the Cubs' system. He worked at rookie-Mesa in 2010-11, short-season Boise in 2012, and double-A Tennessee in 2013. He earned his Bachelor's degree in Kinesiology with a concentration in exercise science in 2011 from Cornell College in Mount Vernon, Iowa and is a certified through the National Strength and Conditioning Association. The I-Cubs open the 2016 season at Principal Park on Thursday, April 7 at 3:08 PM against the Round Rock Express. Season ticket and mini-plans are available now. Single-game tickets will go on sale in March. For details, fans can visit iowacubs.com or call (515) 243-6111.